The CMU1000 is an electronic evaluation unit for permanent online condition monitoring of machines and systems. In order to achieve this, it’s essential to supply the device with relevant data. The reception of this data happens thanks to the connection of sensors to the device, which are recording the data. Then, it is possible to transfer this data (processed or unprocessed) by the CMU 1000. This happens via different ports or as an analogue value to other devices and/or monitoring levels. The CMU 1000 processes the application program stored in it continuously and cyclically like a PLC. The user creates this program simply and conveniently on a PC using the CM Editor developed for this purpose and then uploads it to the CMU 1000. Moreover, the CM Editor is part of the HYDAC PC software CMWIN Version V03 or higher. It provides the various tools and functions in accordance with IEC 61131 for designing, integrating and testing the user program using “drag and drop” operations. What’s more, for status indication and for displaying messages and values on the device itself, there is a back-lit LCD display and three different coloured LEDs. When there is an operation of the CMU 1000, there is an input of the data on site using a built-in keypad within the menu structure of the device. Furthermore, the CMU 1000 is for use in machines in both the stationary and mobile sectors. 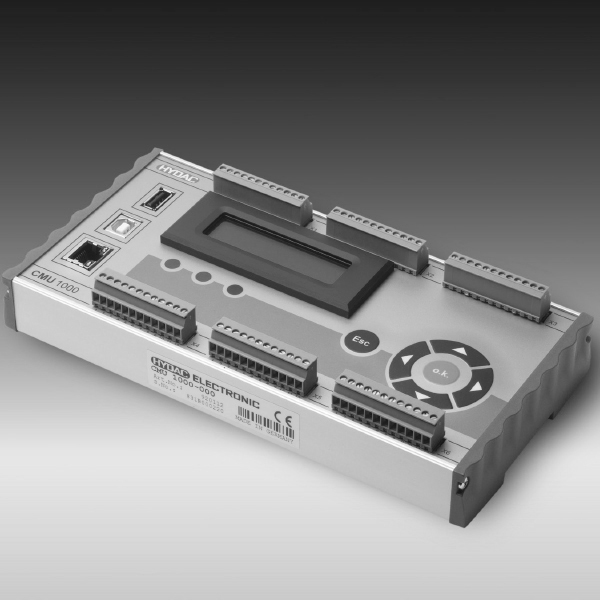 Therefore, it is possible to connect easily to higher-level control, monitoring and bus systems using the built-in interfaces or in combination with an additional coupling module.